To-ji Temple 「東寺」, literally “East Temple”, was founded at the beginning of the Heian Period just after the capital was moved to Kyoto in the late 700s. 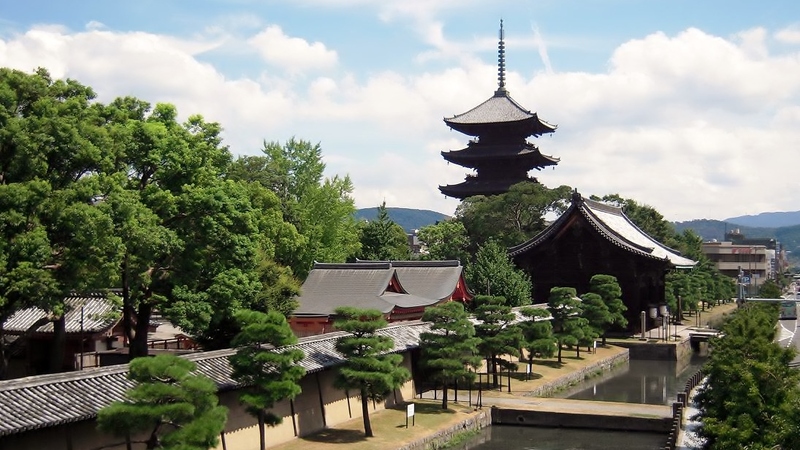 The temple has many buildings, including the five-storied pagoda which is 53 m tall and a symbol of this temple. The treasury contains many National Treasures and cultural properties. Although the temple has been destroyed by fire and restored many times, the layout of this temple, including the Nandai-mon (gate) at the entranceway, the Kon-do in which the priests read the Buddhist scriptures, and the Jiki-do where they have their meals are arranged in a straight line, just as they were at the time that the temple was first established. Since the high priest Kobo Daishi ( the founder of To-ji) died on the 21st day of the month, a Buddhist memorial service for the dead (called a “hoyo”) is performed here on the 21st of every month. A popular flea market “Kobo-ichi” is held on the same day that has a history of almost 500 years. A wide variety of new and second hand goods are on sale, including clothes, tools, sculptures, kimono, antiques, pottery, toys, food. This waffle is made using rice flour and a generous amount of aromatic matcha. It’s not too sweet and has a moist and firm texture. There is only a limited number available each day because they are made by hand. Kyoto’s landmark, The five story pagoda at To-ji Temple is lit up with autumn colors. Easy access from JR Kyoto station.